The mere concept of a double version of Coors' Blue Moon piqued my interest as a ridiculous novelty as soon as I heard of Blue Moon Grand Cru, but the $10+ price tag ($28.39 SPE) was more than I was willing to pay for a laugh. A few months ago Brady tweeted that he'd seen it on sale for 5 or 6 bucks at a Fred Meyers, but it wasn't until a couple weeks ago that I saw such a deal myself, at the Hawthorne Fred's. When I did, I plunked down my $6 with a sigh, and stuck the bottle in the refrigerator, thinking I'd at least get a blog post out of it. Well, I'll probably get a headache out of it too. My impression of it is that it's too sweet, kind of like the cheap champagne that there was too much of at our New Year's Eve party, and alcohol is the most prominent flavor component, despite the relatively reasonable 8.2% proclaimed on the label. There is a pleasant flowery Belgian yeast flavor to it, and a hint of Belgian Wit spices. But the sweetness and the surprising booziness have hangover written all over them. I'm losing interest. It's not better than I expected it to be, but I suppose it's not really worse than I expected, so let's give it a grade of C. If you want a big Belgiany beer, spend your money on a Unibroue or a 4-pack of Duvel or North Coast Pranqster. You'll be much better off. But you knew that already. If you're bored, part of the Blue Moon marketing materials includes a "Tasting Journal" (pdf). Really it's just a marketing brochure for the beer, but it contains some real howlers. "Traditional Belgian Wits tend to be tart or sour. They’re garnished with a lemon to help accent these flavors. ... We were the first brewery to garnish a Belgian-style wheat ale with an orange. And right away, we knew we discovered something special, because other brewers latched on to the idea." Mm-hmm, right. I guess the biggest question for me is this: who is this beer aimed at? 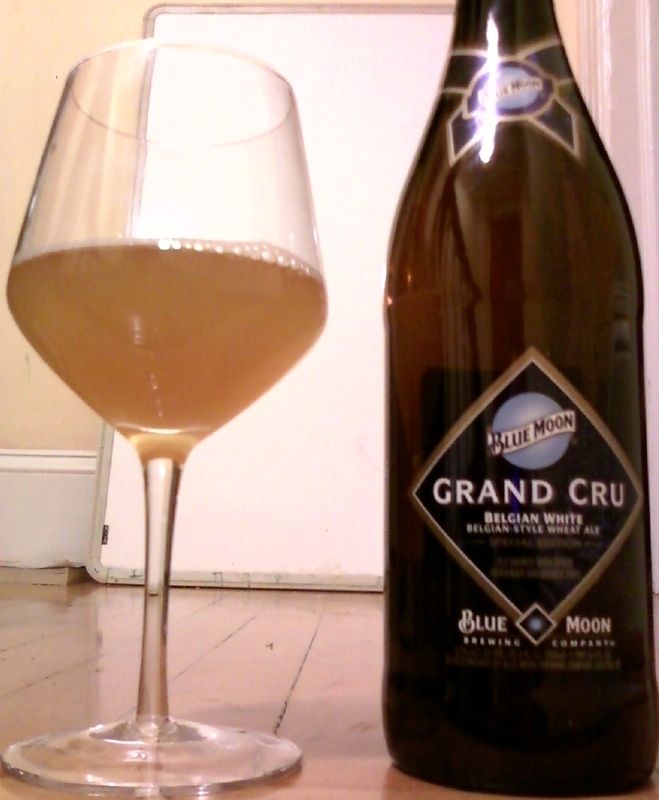 Blue Moon drinkers won't like it; non-Blue Moon drinkers won't like it enough? What's the purpose? It's aimed at people like us who will try anything once. And, possibly more accurately, people who buy gifts for people like us. i tried it last year, I didn't find it outright offensive, but it's certainly not worth the price. ElGordo: Yep, I think you nailed it. For thrill-seekers only. Doc: Oh, don't worry, when I fall on hard times I'll be drinking something much cheaper anything Coors makes. Just remember Bill... Life's to short to drink bad beer. Yes, but it's better to regret something you have done than something you haven't done. I'm still kicking myself for never trying that Clear Beer that Miller came out with in the 90's. Who is it brewed for? Good question. I ponder this question whenever a product like this comes out. My guess is that it's aimed at the same people who drink Blue Moon--people who sorta kinda like craft beer, but not really. People who want to drink something with more flavor than Bud, but with a tame, approachable flavor. Obviously, the brewery could have made any beer they'd wanted, but they made this thing. Apparently they believe it fits the profile of their market. Of course, breweries constantly mistake their audience, and if you stood bottles of failed beer end to end, they'd reach the moon. Anyway, I'm glad someone tried this so I don't have to. So... no one cared to comment on the marketing info that had Belgian Wits garnished with a lemon?